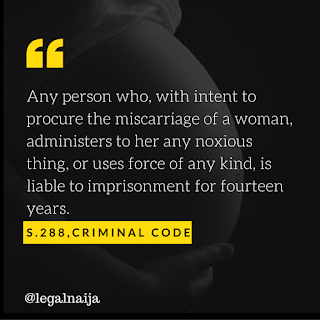 Home » Abortions , Criminal Code Act , Nigeria » Are abortions legal in Nigeria? Though abortions are illegal in Nigeria, according to the US-based Guttmacher Institute, statistics show that at least 1. 2 million induced abortions take place in various parts of Nigeria every year, with the highest number coming from the South-South part of the country, followed by the North-East and South-West. Furthermore, statistics show that 10,000 women die every year in Nigeria from unsafe abortions, carried out by untrained people in unsanitary conditions. This can be leveled down to 27 deaths a day. Abortions are legal, only when it is done to save the life of the woman and two physicians must certify that the pregnancy poses a threat to the life of the woman. More than 456,000 unsafe abortions are done in Nigeria every year; the US Guttmacher Institute estimates. Any person who, with intent to procure miscarriage of a woman whether she is or is not with child, unlawfully administers to her or causes her to take any poison or other noxious thing, or uses any force of any kind, or uses any other means whatever, is guilty of a felony, and is liable to imprisonment for fourteen years. 229. Any woman who, with intent to procure her own miscarriage, whether she is or is not with child, unlawfully administers to herself any poison or other noxious thing, or uses any force of any kind, or uses any other means whatever, or permits any such thing or means to be administered or used to her, is guilty of a felony, and is liable to imprisonment for seven years. 230. Any person who unlawfully supplies to or procures for any person anything whatever, knowing that it is intended to he unlawfully used to procure the miscarriage of a woman, whether she is or is not with child, is guilty of a felony, and is liable to imprisonment for three years. Such offenders however cannot be arrested without an arrest warrant duly executed by the relevant authorities. There are certain groups clamouring that provision should be made for people in peculiar situations other than a threat to life, such as where the woman was raped by an assailant. The question being asked is whether such women be forced to live with the results of the shameful act which they will always hurt to remember? This clashes with proponents of the school of thought that life is sacred and taking it should be resisted in all fronts, most especially via capital punishment. The debates will definitely continue, however, as the law stands today, in Nigeria, abortions are illegal, except on the condition of saving the life of the mother. What’s your opinion, should abortions be made legal?